Captain Benny Griessel is a recovering alcoholic, so is his friend, Alexa. After much persuasion she is making a come-back, reviving her singing career. Benny is to be her rock, helping her regain her confidence. However, their plans are derailed when Benny is called away from her first public outing to deal with a shooting incident. A policeman has been shot and an email sent to SAPS states that unless the killer of Hanneke Sloet is arrested a police officer will be targeted each day. Sloet, a successful and sultry lawyer, had been slain in her apartment a month earlier but the case had quickly gone cold. Griessel is put in charge of re-investigating the Sloet murder, whilst his colleague, Mbali Kaleni is assigned the task of finding the sniper. Along with the political and media pressure, adding to Benny’s woes is trying to keep Alexa from sliding all the way off the wagon and to make sure he doesn’t join her. 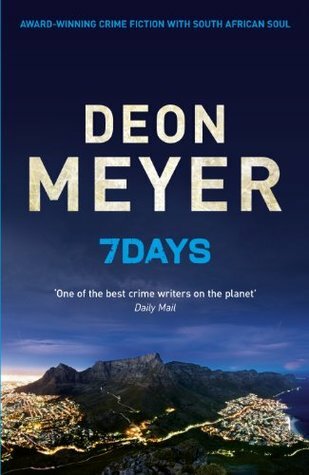 Deon Meyer might well be the best writer of police procedural thrillers at present. 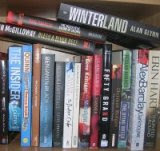 His stories have all the good hallmarks of a police procedural – an interesting lead cop and supporting cast, a strong sense of place, interesting puzzles, and attention to detail – but they also have the pace and tension of a thriller; the rollercoaster ride of a race against time. And so it is with 7Days. Captain Benny Griessel, a man who trails a litany of personal failures in his wake, is given the task of solving a murder while under immense pressure from a sniper shooting police officers and bosses, politicians and media demanding immediate results. Meyer expertly balances character development, plot and pace, producing a highly engaging and entertaining read that not only delivers an intriguing story but nicely advances the longer narrative of the Griessel books. I was hooked from the first page and picked it up at every opportunity to find out how Benny was getting on at solving the two intertwined cases.